As promised, I'm going to be swatching and testing eyeliners from Barry M. I don't really have that many pencil eyeliners from Barry M, as I tend to favour their liquid liners, but I still wanted to include these in the challenge. I'd also like to point out, that the black and blue liners are part of a Limited Edition Duo Pencil liner that I own, which is why they are bothered numbered: 4. So, this first test challenges each eyeliners ability to create the perfect smokey look; meaning that where the liner is initially placed stays prominent, whilst the surrounding area has a lovely smokey effect. 4. Black smudges into a really nice smokey-like way, with the black fading but not too much. 4. Blue took a little effort, but did smudge nicely, with the blue fading in a similar way to the black. 10. Gold smudged completely, leaving no sign of where it was initially placed, although smudged doesn't sound quite right...but it didn't really fade, it more dispersed, I guess than anything. I don't think that I've known a liner do that before! Verdict: The Gold is definitely not suitable for a smokey look, and the Pink faded quite a lot. Therefore, I declare the black and blue joint winners...kind of ironic! Result: Unsurprisingly, the Gold didn't take long to fade at all, and barely two hours into the test, it had completely gone, barely surviving the "Washing Hands" part of the test. 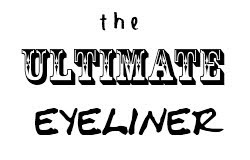 Tomorrow: It's Bourjois' turn, as I continue in my challenge to find the Ultimate Eyeliner!